This groundbreaking work presents original research on cultural politics and battles in Egypt at the turn of the twenty-first century. It deconstructs the boundaries between ‘high’ and ‘low’ culture, drawing on conceptual tools in cultural studies, translation studies, and gender studies to analyze debates in the fields of literature, cinema, mass media, and the plastic arts. Anchored in the Egyptian historical and social contexts and inspired by the influential work of Pierre Bourdieu, it rigorously places these debates and battles within the larger framework of a set of questions about the relationship between the cultural and political fields in Egypt. Samia Mehrez is professor of Arabic literature in the Department of Arab and Islamic Civilization and director of the Center for Translation Studies at the American University in Cairo. She is the author of The Literary Atlas of Cairo and The Literary Life of Cairo (both AUC Press, 2010). 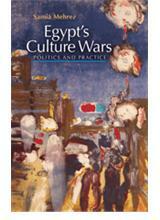 Request: Egypt’s Culture Wars .